Our first trip to the Yucatan peninsula was all about discovering the Mayan Yucatan. Culture, history, anthropology and archaeology. Inherent in the exploration was the experience of the meeting and melding of the Mayan and Spanish cultures into the modern state of Yucatan. Five days of applied exploring gave us plenty to see, experience, and try to digest. Five days was enough to show us how much more time we will need in the future. Trips are already being planned. Five days yielded too much to offer in a single blog. Too many pictures culled from many more. Too many observations and reflections. On top of this, I have invested in some research I would like to share for those looking a little deeper into the history and culture of the Mayan Yucatan. Therefore, I offer this blog as a directory of pages I have written over the course of the last month. Each page, or blog, and its associated gallery of expanded photography and information constitutes a day in the life of our trip to discover the Mayan Yucatan. I hope you may enjoy the offerings, and wish you many happy trails. Merida – Capital of the state of Yucatan was the perfect base to explore Mayan and Spanish cultures and history. This blog is a review of the city, some places we saw and our hotel wonderfully located near the center of local activity. Each day began and ended in the city of Merida. There were many wonderful things to see and do. I felt the city deserved a page of its own. 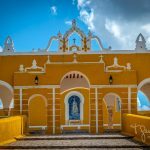 Merida Gallery – An expanded pictorial of the Merida blog. I did not want to belabor my blog pages with photos, nor did I want to shortchange the sharing of what we saw and experienced, so along the way I decided to offer two pages for each blog. 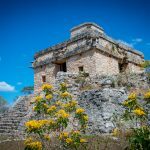 Dzibilchultan – A visit to the Mayan ruins of Dzibilchaltun in the Yucatan north of Merida was a great way to kick off our initial immersion into Mayan history and culture. Relative to other ruins we will visit in the next few days, this is a rather quiet and less visited location. It was a super hot day, and we had the great pleasure of discovering the joy of the “cenote” which is a swimming hole common to this area of the Yucatan. We made a point each day of rewarding ourselves with a refreshing dip in some local cenote. Uxmal – A visit to the Mayan ruins of Uxmal south of Merida gave us a great taste of Mayan history and culture. The ruins are grand and extensive. Perhaps my favorite Mayan city of our visit. On this day we chose to hire a guide to show us around. Well worth the very reasonable price. He gave us a lot of insight and information. We had the pleasure of his company for about an hour and a half, and they we then commenced to explore on our own. This is a very expansive ruin and well worth a full day. 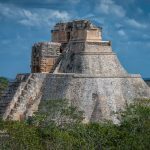 Uxmal Gallery –An expanded collection of photographs of our visit to Uxmal. Photos are collected by location with some extra insights offered to illustrate the illustrations. 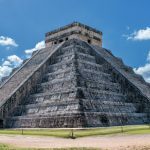 Chichen Itza – A visit to the Mayan ruins of Chichen Itza was not originally in the plans, but a good traveler has no set plans, and this site must be checked off by any student of Mayan culture. 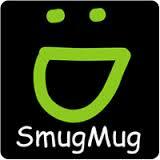 It is overrun and commercialized and worth the visit. We again hired a guide who gave us a few hours of valuable insights, and then we took to our own and spent the day exploring this huge site. Most of the crowds are focused on the plaza around El Castillo (pictured here), so we had plenty of time to be away from the throngs. Chichen Itza Gallery – An expanded collection of photos sorted by location within the site. In this gallery I have also started expanding research, and offer more information of interest as well as links for further reading. 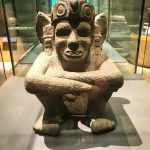 Mayan Anthropology – Our last day in Mérida is dedicated to an exploration and discovery of Mayan anthropology and archaeology of museum quality. We had the happy surprise of finding Museo Regional de Anthropologia Estado de Yucatan; Palacio Canton. 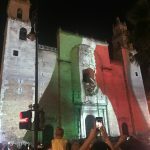 A little more background on Merida and Mayan Spanish cultural intersection along with links is offered on this page. No gallery associated with this page this time as the page is largely pictorial and inclusive. Everything I shot at this site was with a smart phone. Sometimes the convenience cannot be topped.